Visiting the tomb of the Italian saint, celebrating Mass outside the huge church bearing his name and meeting the patients and staff of the hospital he established, the pope urged priests to look to him during the Year for Priests. 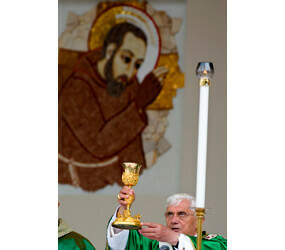 Love for the Eucharist is what motivated Padre Pio’s “total willingness to welcome the faithful, especially sinners,” the pope said during an evening meeting with priests, religious and young people in San Giovanni Rotondo June 21. “The sacrament of penance must be valued more highly and priests must never resign themselves to seeing their confessionals deserted nor limit themselves to noting the faithful’s lack of appreciation for this source of serenity and peace,” the pope told them. A major summer storm forced the pope to fly by plane rather than helicopter to the southern Italian city where Padre Pio entered the Capuchin order and ministered and where he died in 1968. Commenting on the Gospel story of Jesus calming the storm, he said Jesus’ action was clearly a sign of his lordship over every negative power in the heavens and on the earth. “Like it was for Jesus, the true battle, the radical combat Padre Pio had to sustain was not against earthly enemies, but against the spirit of evil,” Pope Benedict said. “The greatest storms that threatened him were the assaults of the devil, which he defended himself against with the armor of God, the shield of faith and the sword of the Spirit, which is the word of God,” the pope said. Padre Pio devoted himself so totally to Christ that he became an instrument of Christ’s “power of love for souls, of pardon and reconciliation, of spiritual fatherhood and of concrete solidarity with the suffering,” he said. “The stigmata that marked his body intimately united him to the crucified and risen One,” the pope said. Padre Pio bore the stigmata – the bleeding wounds of Christ – for half a century. “This was always his first concern, his priestly and paternal anxiety: that people would return to God, that they could experience his mercy and, interiorly renewed, they could rediscover the beauty and joy of being Christians, of living in communion with Jesus, of belonging to his church and practicing the Gospel,” he said. Addressing representatives of the thousands of Padre Pio prayer groups scattered around the world, members of the Capuchin order and the staff of the hospital he founded, Pope Benedict said that communion with Jesus and personal holiness always must come first in their lives. “Many of you, religious and laity, are so involved with the thousands of tasks required by serving pilgrims or the sick in the hospital that you run the risk of overlooking what is truly necessary: listening to Christ to fulfill God’s will,” he said in his homily. He encouraged them to follow the example of Padre Pio and seek the intercession of Mary. “Then even in the storms that come unexpectedly you can experience the breath of the Holy Spirit that is stronger than any wind,” he said. Reciting the Angelus after Mass, Pope Benedict also offered prayers for the millions of refugees around the globe; the United Nations marked World Refugee Day June 18. “Many people seek refuge in other countries, fleeing situations of war, persecution and calamity,” the pope said. While welcoming them can be difficult, “it is an obligation,” he said.